Get out your dancing shoes and groove to disco hits as we#BlastToThePast and raise money for Beaufort County programs! All proceeds go to the Lowcountry Autism Foundation to provide free diagnostic evaluations and support services. Lowcountry Autism Foundation is proud to host a screening of the award-winning new documentary film #swimteamthefilm, an inspiring look at the rise of a competitive swim team of autistic teens. Following three teammates on the cusp of adulthood, when government services become scarce, Swim Team is a portrait of diverse American families grappling with the problem of "aging out." Over the course of a year, the film explores the overwhelming struggles they face and the triumphs they achieve as they strive for independence, inclusion and a life that feels winning. Swim Team has been screened at numerous film festivals, winning “Best Sports Documentary” at The Hot Springs Documentary Film Festival and chosen as an Artist in Residence film at the Napa Valley Film Festival. LAF will be screening this uplifting film on April 26th at 7:00pm at the Mt. Pleasant campus of Seacoast Church. Information on local resources will be available starting at 5:30pm. Reserve your free tickets here: https://impactflow.com/event/swim-team-hosted-by-lowcountry-autism-foundation-2401 and join us! You don’t want to miss this moving and hopeful experience. All proceeds go towards funding the valuable services here at Lowcountry Autism Foundation. 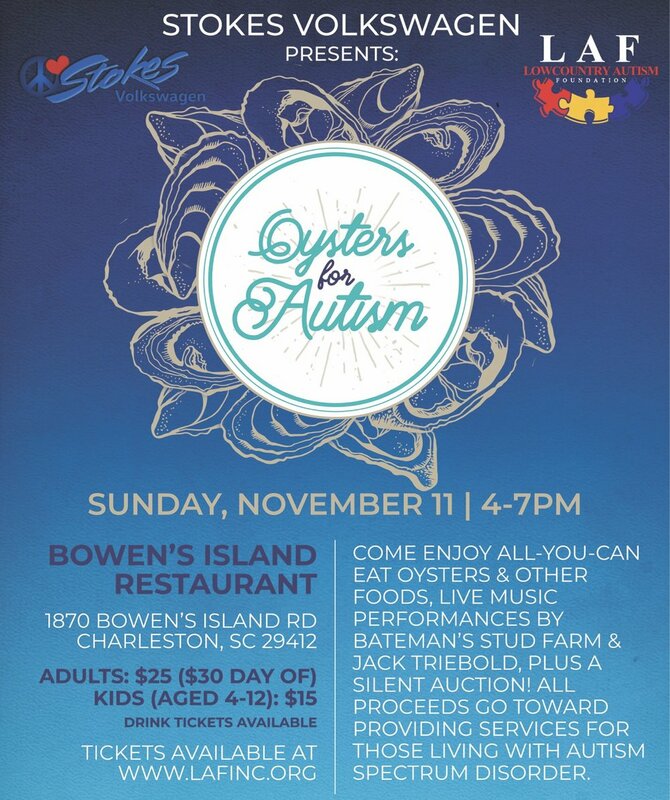 Enjoy a night of live music, oysters, drinks, and a silent auction at Bowens Island! All proceeds will benefit individuals and families living with Autism Spectrum Disorder and who are helped by the Lowcountry Autism Foundation at the MUSC Children's Hospital. 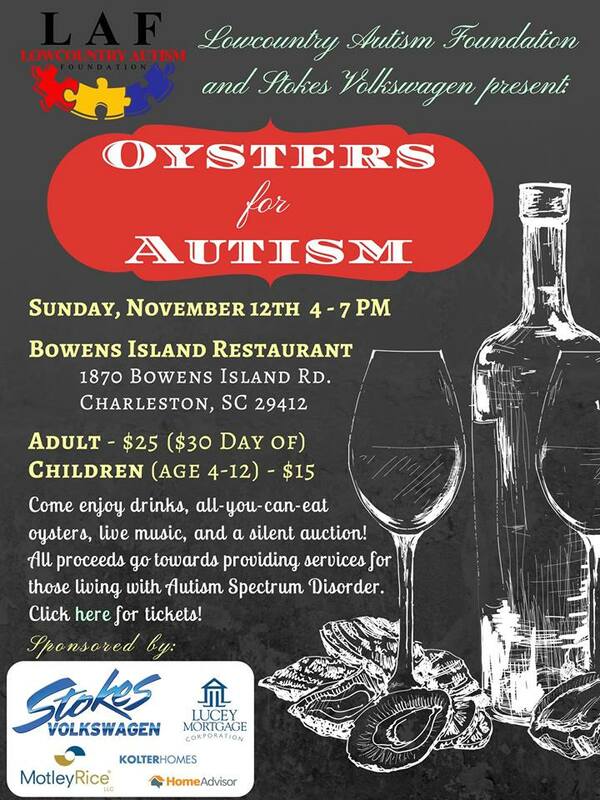 Join us November 13th from 4-7 PM at Bowens Island Restaurant. Tickets are $25 for adults, $15 for children under 12, and $30 at the door the day of the event. Children 3 and under are free of charge. Tickets include all you can eat oysters, other food, and non-alcohol beverages. Beer and wine will be available for purchase at the day of the event (for those over 21 years of age). The event will also feature Live Music by Jack Triebold and an alternative local rock band, Batesman's Stud Farm. A Silent Auction will accompany the oyster roast!